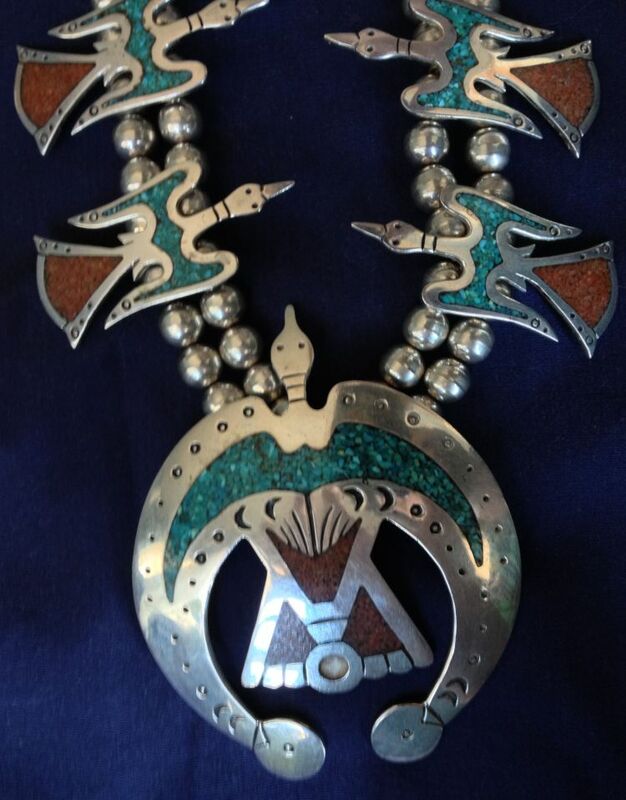 I recently inherited a squash blossom necklace that has turquoise and coral chips inlaid in peyote birds. 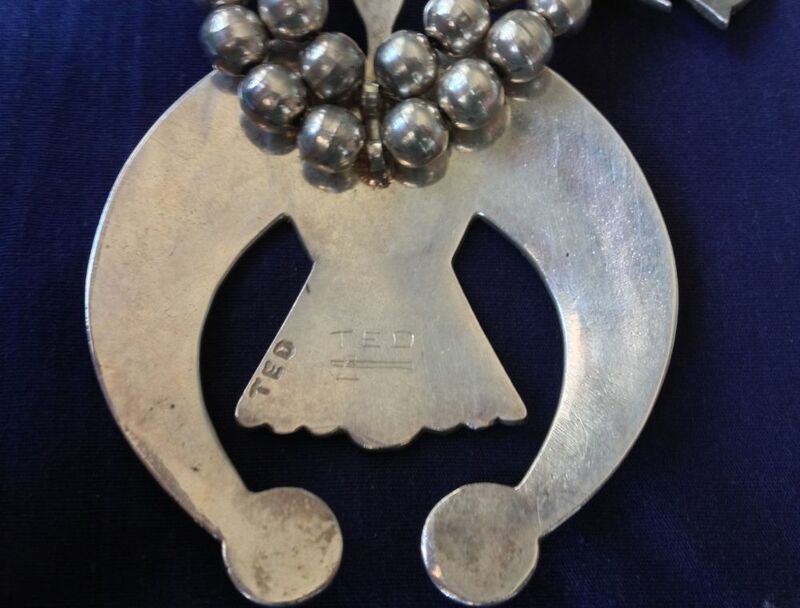 There is one large bird at the bottom and five that go up each side of the necklace. My question is in regards to the hallmark. The piece is stamped twice. Once with the name/initials “TED” in a vertical position so that the T is closest to the floor. The other mark is much fainter and says “TED” horizontally over a tomahawk. Have you ever come across this hallmark, and if so can you tell me anything about the artist? I wish I could help but I do not know this hallmark, nor do I see it in any of my references. Perhaps another reader has seen it. I am not familiar with that hallmark but have posted it here in case someone else does. 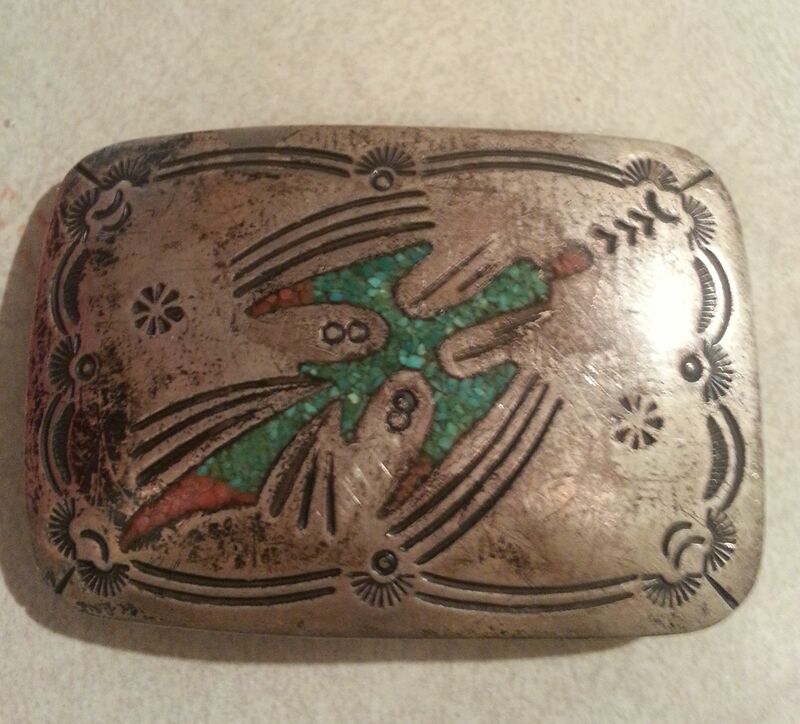 Nice vintage peyote bird chip inlay belt buckle though ! Is this a Tommy Singer Chip Inlay Bracelet? 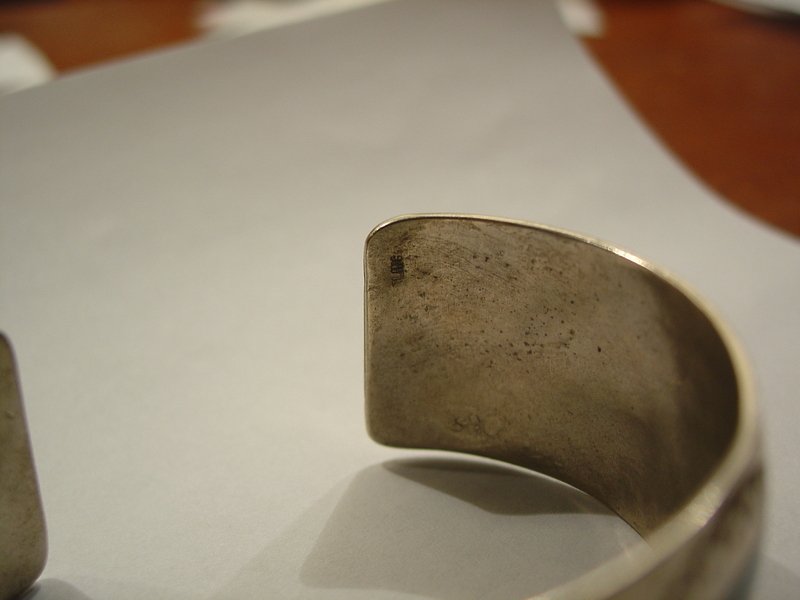 bracelet that I have seen that was verified to be made by Tommy has been very thick. recommendations that you may have to verify the authenticity of the this bracelet would be most appreciated. I am also trying to see if I can get a chip inlay bracelet made by Tommy for my wife. 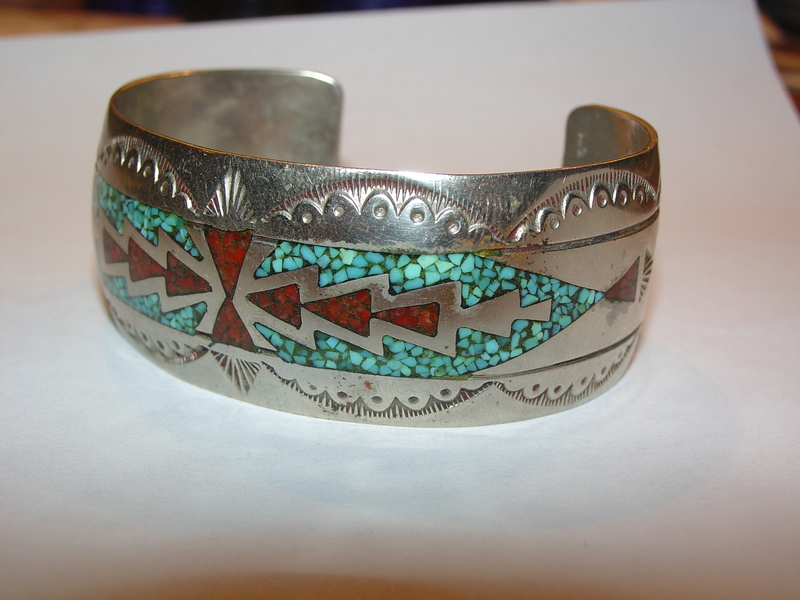 The reason for my quest is that my wife’s mother had a Tommy Singer bracelet for many years and when her mother died, my wife took possession of her mother’s bracelet. She unfortunately lost it and we have been attempting to replace it for the last couple of years. To give other readers some background. Chip inlay is a method where cavities in jewelry are filled with a mixture of crushed stone, typically turquoise and coral, and epoxy resin. The piece is then polished smooth after the resin has hardened. 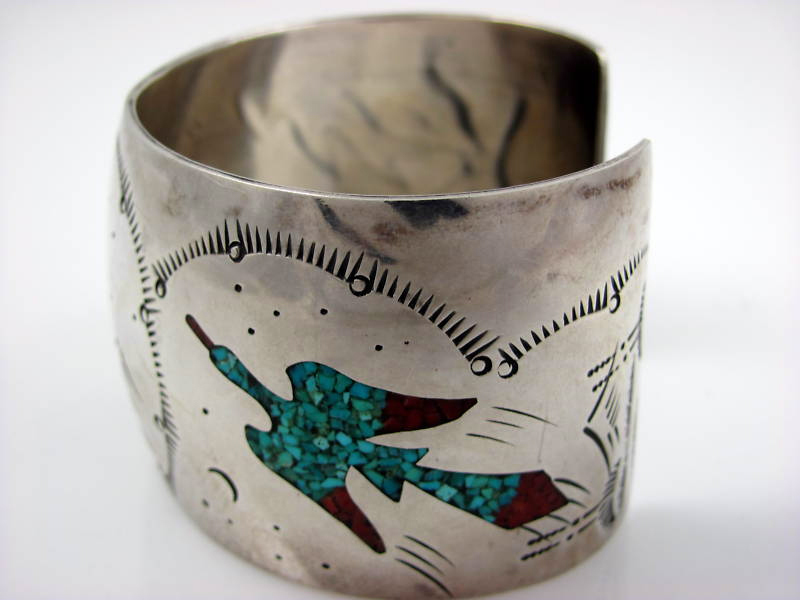 Navajo Tommy Singer is often credited for first using chip inlay in Native American jewelry. Known world wide for his silver work, chip inlay and necklaces, Tommy (Thomas) Singer pieces are highly collectible and sought after. 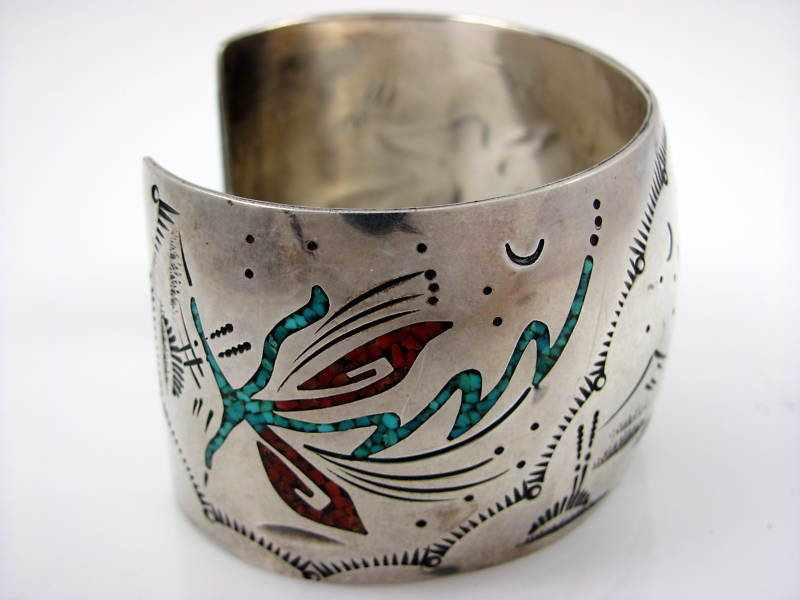 The Singer family has been involved in silversmithing, stone and beadwork for a very long time, handing the art down from one generation to another. Tommy Singer grew up on in the community of Dilcon on the Navajo Reservation in Arizona. The hallmark stamp shown above on your bracelet is the last half of STERLING………a partial R and LING. As far as whether or not this is a Tommy Singer piece, I could not say. 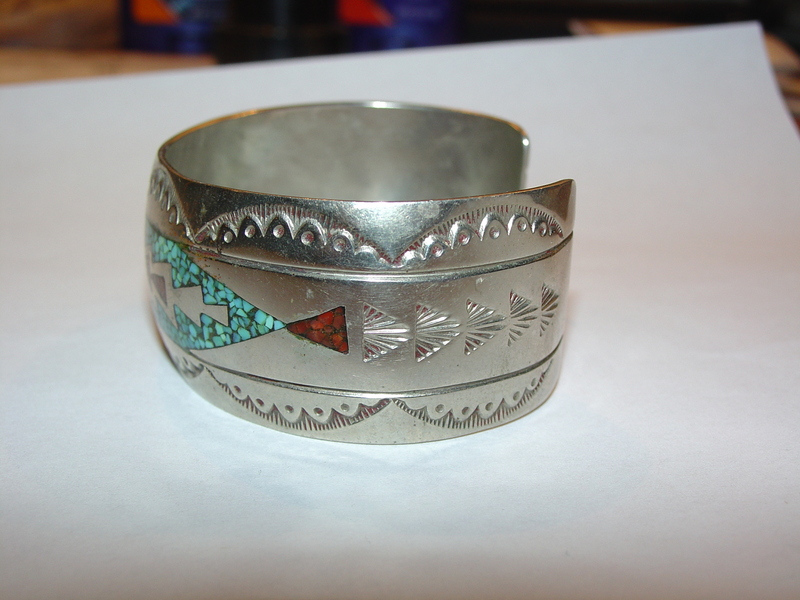 We have had similar chip inlay pieces, both vintage and contemporary, in our store that were made by a variety of other Navajo artists. Your beautiful buckle is a handmade chip inlay buckle. Chip inlay is a method where cavities in jewelry are filled with a mixture of crushed stone, typically turquoise and coral, and epoxy resin. The piece is then polished smooth after the resin has hardened. 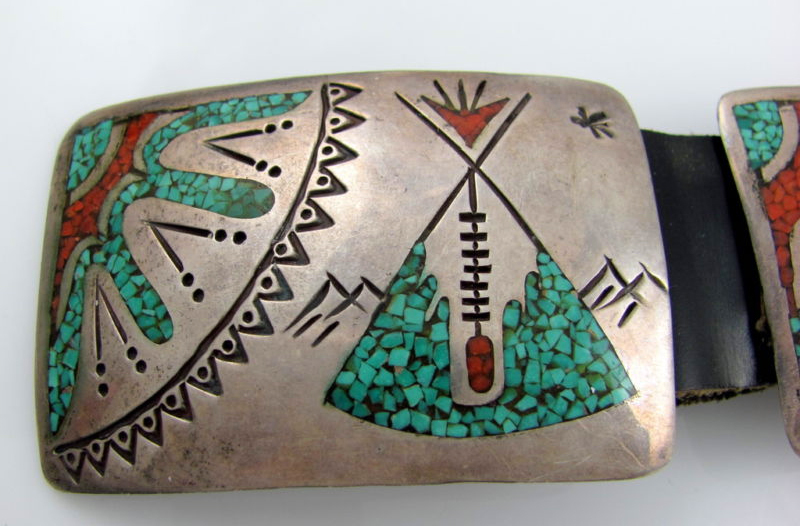 Navajo Tommy Singer is often credited for first using chip inlay in Native American jewelry although others have also been associated with it and many have used and still use the technique. I say handmade because it does not look like it was made from a “buckle blank” – all looks hand crafted. I’d guess maybe 20-30 years old. The symbols are interesting – really more indicative of Plains tribes with the tipi and peyote bird. These would be symbols that would be associated with Oglala Lakota and yet the work looks to be Navajo. 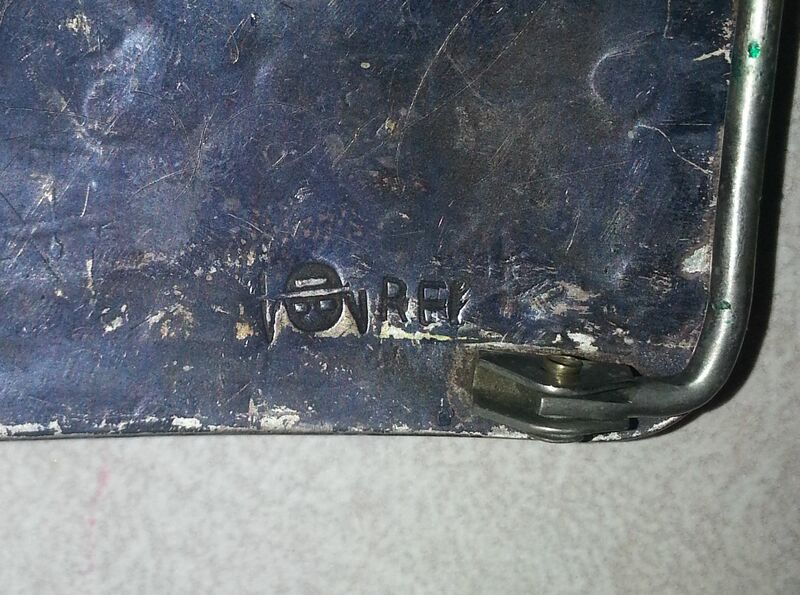 Here is a similar buckle we had in our pawn shop. 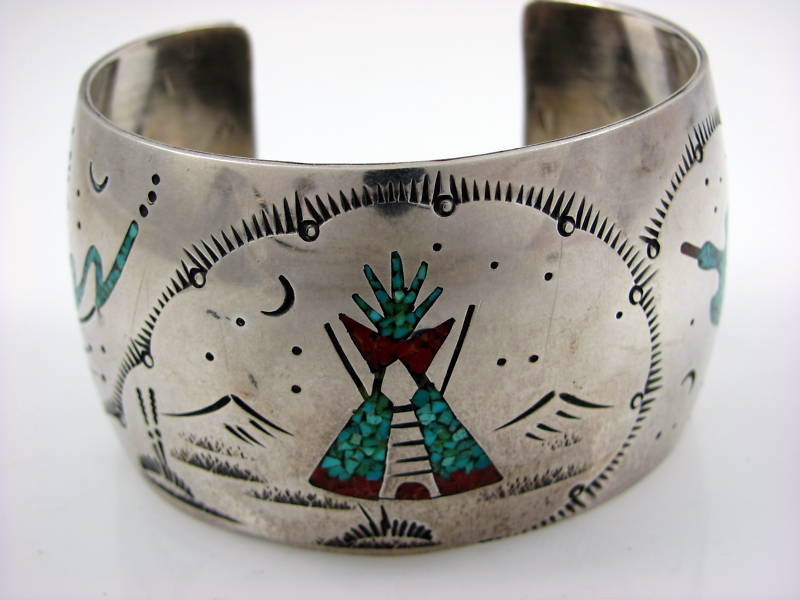 Linda, an avid and knowledgeable merchant of vintage Native American jewelry, and a reader and frequent contributor to this blog, sent these photos of authenticated early Tommy Singer pieces, showing the use of similar symbols but in Tommy Singer’s style. Thank you Linda. Beautiful pieces ! !